Quick, easy, warm, creamy and ADDICTIVE!!! This very simple crabmeat dip will put a smile on the face of even your crabbiest guests! Serve with your favorite crackers and pretzels. 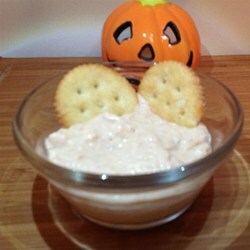 In a medium microwave safe bowl, blend crabmeat, cream cheese, horseradish, Worcestershire sauce, chili sauce and lemon juice. Microwave the mixture on high 3 to 5 minutes, or until hot and bubbly.